One of the founders of the Impressionist movement, Edgar Degas was a prominent artist in the last half of the 19th century. Born to wealthy family, he began his schooling with a baccalaureate in literature in 1853. Due to the wishes of his father, who wanted him to go to law school, he enrolled at the University of Paris in 1853 to pursue a law degree, where he made little effort. Degas, who at age 18 had transformed one of the rooms is his house into a studio, and was a registered copyist at the Louvre by 1853, left law school after two years, and a year later traveled to Italy studying the art of the great masters. His paintings were exhibited at the Paris Salon beginning in 1865, but they attracted little attention, and his subject matte slowly transitioned from history paintings to more contemporary subjects. In 1870, at the outbreak of the Franco-Prussian War, he enrolled as a member of the National Guard, but his eyesight, which was found defective during rifle training, was troublesome and so he could not serve. 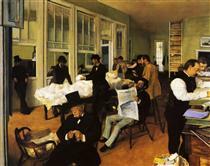 Three years later, in 1873, Degas’ father died, revealing a massive amount of business debt held by his brother, Rene. 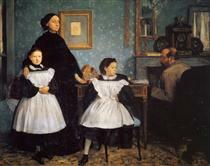 Degas was forced to sell the family home and many family paintings in order to cover the debt, and for the first time, had to rely on the income from his paintings for survival. It was in 1874 that he began producing his most successful works. 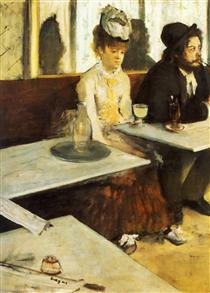 Although he is considered one of the founders of Impressionism, and he indeed worked with impressionist artists, such as Edouard Manet and Pierre-Auguste Renoir, he rejected the label “Impressionist.” He detested the scandals brought about by their Impressionist Exhibitions, and he mocked them for painting outdoors. His personal life was outwardly uneventful, due to his belief that an artist should live private lives of solitude. He thus lived a life of solitude, and eventually broke with all of his Jewish friends, due to his anti-Semitic beliefs and argumentative nature. He never married, opposed social change and technological innovations, always painted indoors, and ceased painting by 1912, at which he time he was nearly blind. He died wandering the streets of Paris in 1917. 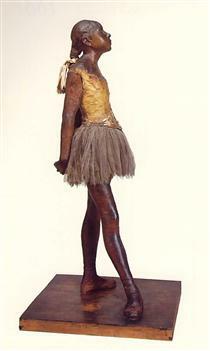 Edgar Degas (US: /deɪˈɡɑː/ or UK: /ˈdeɪɡɑː/; born Hilaire-Germain-Edgar De Gas, French: [ilɛːʁ ʒɛʁmɛ̃ ɛdɡaʁ də ɡɑ]; 19 July 1834 – 27 September 1917) was a French artist famous for his paintings, sculptures, prints, and drawings. 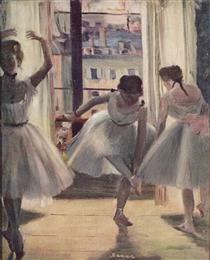 He is especially identified with the subject of dance; more than half of his works depict dancers. He is regarded as one of the founders of Impressionism, although he rejected the term, preferring to be called a realist. He was a superb draftsman, and particularly masterly in depicting movement, as can be seen in his rendition of dancers, racecourse subjects and female nudes. His portraits are notable for their psychological complexity and for their portrayal of human isolation. At the beginning of his career, Degas wanted to be a history painter, a calling for which he was well prepared by his rigorous academic training and close study of classic art. In his early thirties, he changed course, and by bringing the traditional methods of a history painter to bear on contemporary subject matter, he became a classical painter of modern life. 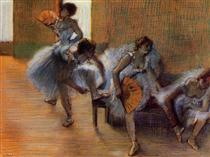 Degas was born in Paris, France, into a moderately wealthy family. He was the oldest of five children of Célestine Musson De Gas, a Creole from New Orleans, Louisiana, and Augustin De Gas, a banker. His maternal grandfather Germain Musson, was born in Port-au-Prince, Haiti of French descent and had settled in New Orleans in 1810. 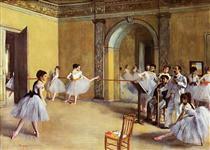 Degas (he adopted this less grandiose spelling of his family name when he became an adult) began his schooling at age eleven, enrolling in the Lycée Louis-le-Grand. His mother died when he was thirteen, and his father and grandfather became the main influences on him for the remainder of his youth. 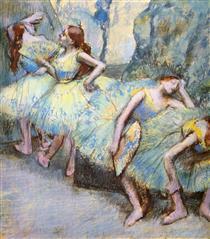 Degas began to paint early in life. By the time he graduated from the Lycée with a baccalauréat in literature in 1853, at age 18, he had turned a room in his home into an artist's studio. Upon graduating, he registered as a copyist in The Louvre Museum, but his father expected him to go to law school. 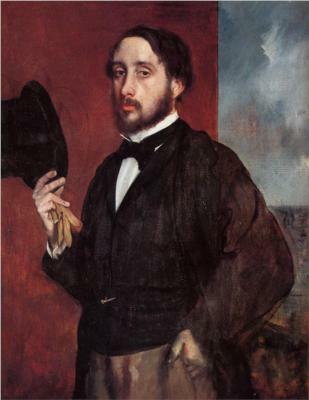 Degas duly enrolled at the Faculty of Law of the University of Paris in November 1853, but applied little effort to his studies. In 1855 he met Jean-Auguste-Dominique Ingres, whom Degas revered and whose advice he never forgot: "Draw lines, young man, and still more lines, both from life and from memory, and you will become a good artist." 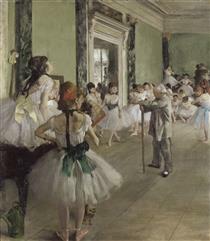 In April of that year Degas was admitted to the École des Beaux-Arts. He studied drawing there with Louis Lamothe, under whose guidance he flourished, following the style of Ingres. In July 1856, Degas traveled to Italy, where he would remain for the next three years. In 1858, while staying with his aunt's family in Naples, he made the first studies for his early masterpiece The Bellelli Family. He also drew and painted numerous copies of works by Michelangelo, Raphael, Titian, and other Renaissance artists, but—contrary to conventional practice—he usually selected from an altarpiece a detail that had caught his attention: a secondary figure, or a head which he treated as a portrait.